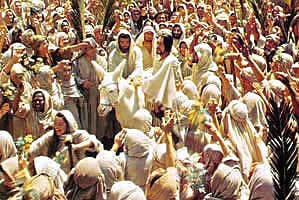 When Jesus came into Jerusalem, everyone was celebrating. It was a joyous moment. The King had arrived. But their cries were political cries. Hossana. A political solution. Jesus, though, had another agenda. Jesus, as always, lead by the Spirit, makes his way straight to the Temple. And there he drives out the money changers. This is a fiery Jesus, not an impotent philosophical prophet. I find the order of events interesting. The Court where Jesus drives out the money changers is the Court of the Gentiles. The only place in all of creation where the whole world can come to worship God under the Old Covenant. We miss this. it wasn't because they were changing money. Pilgrims from Greece didn't have Temple Shekels. This is common today when you travel and it was common then. It had to be done. Sacrifices didn't travel well. Who wants to carry a smelly sheep hundreds of miles, feed it, take care of its messes? Much easier to purchase it in Jerusalem. That wasn't the problem. The problem was the SPACE that had occupied. A worship space. A place of honoring God. Not just the Holy of Holies, but the whole Temple was Holy. The Court of the Gentlies was a sacred space. The lesson I hear is this. When Jesus comes in, the first work he does is cleanse the temple. Under the new covenant, the temple is me and its you. Its our inner lives. This Temple has sacred spaces as well. Places designated for worship. And when I allow the neccessary businss of life to invade the places where God has called us to worship, Jesus gets a little upset. As we gather to worship, are there things we are bringing into our sacred spaces with God that should not be there? Work email? Entertainment? Updates? Notifications? All things that are necessary and good in their proper context. But not in the place of Worship. When we came home from Africa, 'people", whomever they are, well intentioned people, mentioned how glad they were we were back. But we have never seen them. When Jesus comes back, will we be happy he's here, or will we prepare a place for him?